I can’t figure out how to prove m ∘ j = id F i by stacking the two diagrams in the reverse order. Could you clarify it? Actually, your proof is better (that’s also how it’s done in nCatLab). I will edit the post. Thanks for spotting it. From the stacking you can get m∘j∘Fj = Fj, and you can get rid of Fj by composing it (on the right) with Fm. I understand the proof as: if there exists an initial object in the category of algebras over the endofunctor F, then it must be the least fixed point of F.
My question is: how do we go from there to stating that taking the fixed point of any endofunctor F gives us an initial object for the category of F-algebras? How do we know that an initial algebra actually exists over F? We derive the Haskell code of a catamorphism from the fact that the diagram commutes, which as far as I understand, derives from the fact that Fix is our initial algebra. I might be missing something important, but I couldn’t find the proof of it. My traditional copout is that the proof would fall outside of the scope of this book. If the proof were simple and intuitive, I’d write about it. But here’s the general idea: You start with an initial object and apply powers of F to it, forming a chain. The colimit of this chain gives you the initial algebra. The proof is due to Adámek. I was confronted to Adámek’s theorem when browsing nCatLab on this topic but I was not sure it was actually the missing link in my reasoning. I have a question about terminology. In the section on catamorphisms you say, referring to the function cata, that “Since we can do this for any algebra alg, it makes sense to define a higher order function that takes the algebra as a parameter and gives us the function we called m. This higher order function is called a catamorphism”. However, you also state that “the catamorphism for this algebra, cata fib, calculates Fibonacci numbers” and later that “the resulting catamorphism cata lenAlg calculates”. In these cases the word catamorphism is used to denote (some instance of) m itself. It is my understanding that this latter use is in fact more consistent with the category theory, which states that there is a unique morphism m from the initial algebra to any other algebra over the same functor, and this m is what we call the catamorphism. Also: following the latter definition, the question whether some function in Haskell is a catamorphism is independent of its implementation (whether using the generic function or not). If the function can be refactored into an application of the generic function cata it is a catamorphism. Am I rightly confused? Can you help me become un-confused? You’re right. It’s the case of naming a function after what it’s producing. I get stuck with this silly problem: If there is a category of F-algebras where every object in the F-algebra is a pair of an object a of the original category and morphism from F(a) → a. So take for example the functor F(X) = 1+ Char × X . The gives as the initial algebra the list of chars or strings. We can also get F(Int) = 1+ Char×Int which we can use to count the length of a list. But if I take F⚬F(X) to be a list of list of chars, then I translate this as F(F(X)) = 1 + Char × F(X) which would be a char followed by a list of chars… but that’s not what we usually mean by a list of lists… What am I getting wrong here? Notice that a list of As is defined as the initial algebra of the functor FA X = 1 + A × X. If you want to define a list of lists, you have to replace A, not X, with a list. Yes, I suppose my problem came from reading the next article on Algebras of Monads, where you mention the μ operator which I keep associating with flattening. So I think I kept making two errors. introduces the μ Functor of type 𝒞^𝒞 → 𝒞 which takes an endo functor in 𝒞 to its initial algebra. So for F above μF = Strings . And F(μF) is just another string as it adds a charater to the front of it. 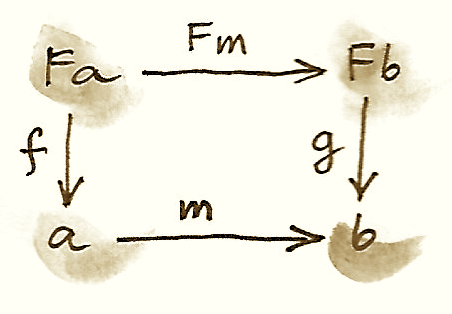 The Arrows in the higher order μ Functor maps natural transformations between functors F and G to an arrow μF to μG. If G(X)=1+μF×X then I guess the arrow would be the unit. Interestingly μG would then be a list of strings (as you point out). You have to carefully distinguish between various structures. There is a family of endofunctors FA X parameterized by A. Then there is a category of algebras for each of these endofunctors. In that category there is an initial algebra, that’s the list of As. This initial algebra is also an endofunctor in A. This particular endofunctor happens to be a monad, giving you the list monad. There is also a category of algebras for this endofunctor. Finally, there is a subcategory of these algebras that are compatible with the monad. This category is isomorphic to the category of monoids. F-coalgebra is dual to F-algebra.